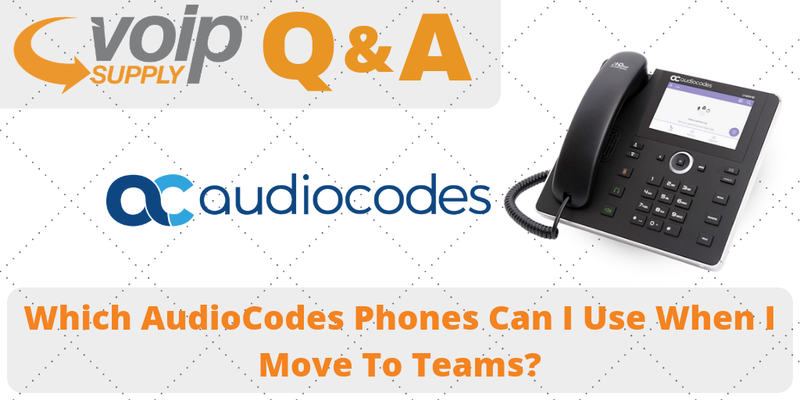 Which AudioCodes phones can I use when I move to Teams? In previous Mom’s calling Q&A series, we have discussed: What is a DECT-base Station? Today, we have more new real questions and answers from VoIP users just like you. Which AudioCodes phones can I use when I move my users to Teams? Q: Which AudioCodes phones can I use when I move to Microsoft Teams? A: All AudioCodes Microsoft 3rd Party Interoperability Partner (3PIP) phones certified with Skype for Business Online will work with and be supported by Microsoft Teams. Here are some of the AudioCodes IP phones that are compatible with Microsoft Teams and Skype for Business: the 405HD, 430/440HD, 445HD, 450HD, and C450HD. They will be able to join Microsoft Teams scheduled meetings and place calls with the same user experience and features. Additionally, at Enterprise Connect in March 2018, Microsoft announced a new line of native Teams phones that run a Microsoft Teams app directly on the phone itself. The AudioCodes C450HD is a native Teams phone. Learn more here. Come back for more VoIP questions and answers next time! If you have VoIP questions to ask us, please submit a technical support ticket or contact our VoIP experts today at (866) 582-8591.